A. Color Bar. The mosaic color-patterns are taken from the color bar on the left side of the window. Areas near the center of the image are colored with values near the top of the color bar. Areas far from the center of the image are colored values near the bottom of the color bar. The color bar can be manipulated to create new color patterns. B. Changing Color Bands. You can select any color in the Color Bar by by clicking on the specific band. When a color is selected, a dotted line appears around the border of the color band and the color and band number will appear in the Adjust Band section. Once a color is selected, you can change the color by clicking-on the "Change Color Button." C. Dragging Colors. You can also copy colors from one band to another by clicking-on a color band and then dragging the color to a new band. This will copy the color to the new band. D. Color Spacing. The position, size and spacing of each band of color controls how the bar colors are applied the pattern. Wider bands contribute their colors to a larger area of the pattern. Narrower bands contribute a smaller area of the pattern. If a band is moved toward the top of the bar, the color will apply to the area near the center of the pattern. Likewise, if a band has been moved toward the bottom of the bar, the color will apply to the area near the edge of the pattern. For this reason, the lines between color bands can be dragged from one position to another, widening some bands while narrowing others. If you hold down the control key while you drag, the program will evenly space the bands above and below the line being moved. In this way, you generate any pattern of color bar band-widths. The image above shows an example of bands being rearranged to produce a color pattern where the dark colors cover a broader range than the light colors. F. Reset Spacing Button. Pressing this button rearranges the color bands in the color bar so they are the same width and evenly spaced. G. RGB Gradient Button. Pressing this button takes the top and bottom color bands and creates a smoothly changing series of intermediate colors by stepping the Red, Green and Blue values between the two values. This is useful for creating special color effects. H. Hue Gradient Button. Pressing this button takes the top and bottom color bands and creates a smoothly changing series of intermediate colors based on hue as opposed to the Red, Green and Blue values. This produces a more colorful gradient than the RBG Gradient. I. Hue Offset. Changing this value shifts the Hue of every band in the color bar the specified amount. This changes the color of all the bands, but doesn't affect their spacing. The value can be anything from 0 to 360, which 360 takes you back to the original color values. J. Mosaic Image. Pressing this button causes the program mosaic the pattern with the colors shown in the color bar. K. Undo Button. Pressing this button rolls back the image to the previous one. This is useful for trying different mosaic color schemes to see which ones you like the best. L. Mosaic Colors. This option allows you to select different color schemes for the mosaic. In Random mode, the colors are selected at random from the entire range of colors a available to the computer. In Gradient Color mode, the colors come from the color bar. Background Color. 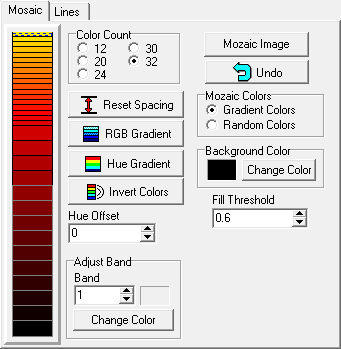 This option allows you to select the background color for the mosaic. This is the color that surrounds the pattern and forms the background for the image. M. Fill Threshold. The mosaic process works by filling areas on the screen that match the background color of the image. The Fill Threshold value controls how close the match has to before the program fills an area. If the value is zero, the match has to be exact. If the value is one, the program will fill areas that are far from an exact match. This is useful for making sure the color mosaic color goes up to the edge of lines without leaving a halo of light colors.